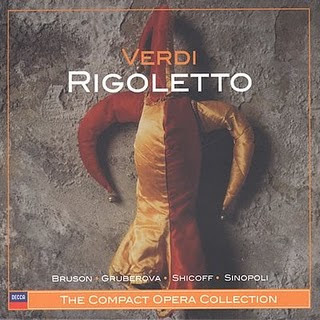 This Rigoletto, though hardly perfect, would make a good, solid introduction to the work for a newcomer. The sound is excellent, both voices and orchestra are bright, strong and clear, and Giuseppe Sinopoli conducts with passion and panache. True, several of his tempos are idiosyncratically slow, but the score’s blood-and-thunder drama is never lost. Furthermore, Verdi purists will be happy that the score is performed strictly as written, with no cuts, no interpolated high notes and no extra-musical effects (shouting, laughter, etc). But I must admit, this come scritto approach is a mixed blessing, because it seems to straightjacket the singers’ theatrical instincts. 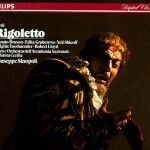 Despite the dramatic power of the orchestra, the cast often seems to be offering a scholarly study of Rigoletto (albeit a lush, beautiful one) rather than a full-blooded performance. 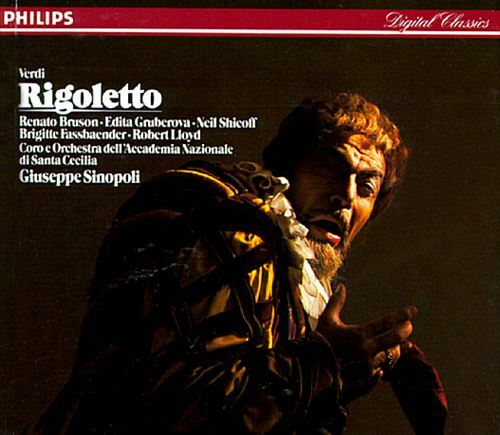 There’s no denying the magnificence of Renato Bruson’s voice. With its dark, velvety richness, warmth, power and gravitas, his status as one of his generation’s leading Verdi baritones is no wonder. But where are the dynamics, the shading, and the heights of humor, rage and pathos that the greatest Rigolettos display? Surprisingly for a singer praised for his stage acting, here he seems to simply belt the role, conveying only the most basic emotions. His colleagues are a bit stronger dramatically, if vocally less impressive. Neil Shicoff is a slightly inelegant Duke, with a brassy-edged tone particularly in the upper register, but for the most part his warm, deep caramel-colored timbre still manages to seduce. Possibly the overall best of the three leads is the Gilda of Edita Gruberova, whose lovely silver-and-cream soprano perfectly expresses the young girl’s innocence and vulnerability. Robert Lloyd is a fittingly dark, gravelly Sparafucile, while Brigitte Fassbaender brings a bright voice and (perhaps more than any of the other singers) dramatic spark to Maddalena. Kurt Rydl is an imposing Monterone and the minor characters and chorus are uniformly excellent. Ultimately, is this a good recording? Yes indeed: I enjoy it every time I hear it. But I’d never recommend it as the only Rigoletto to own. 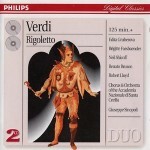 Other performances must be heard as well to convey the full depth and genius of Verdi’s masterpiece.